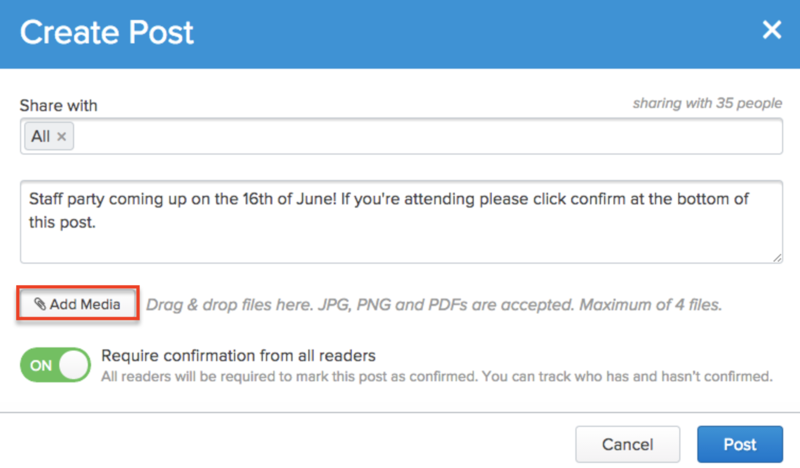 For all of our frequently asked questions about the News Feed, check out this guide. The News Feed is the main communications hub between employers and employees. We've compiled a list of the most frequently asked questions about the News Feed hub. Who deleted our posts / why are they missing / where have our posts gone? We cannot determine who has deleted certain posts within Deputy. The only staff members who have the permissions to delete a news feed post are system admins, and anyone higher up in the hierarchy to the employee who posted on the news feed. Can I Send a Message to All Employees Currently On Shift? Can we attach x document/size? How? 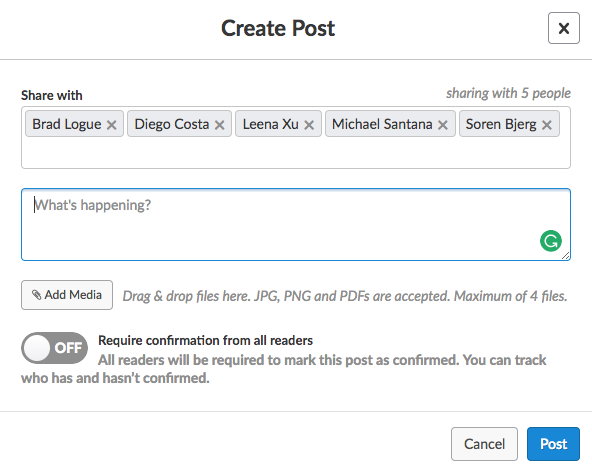 When creating a newsfeed post you can attach up to 4 files (limited at 2mb each). Files can be attached using the add media button or by simply dragging and dropping any JPG, PNG or PDF file. How/Can I edit a post? Currently, you are unable to edit newsfeed posts. How / Can I delete the post of other staff & system admins? Posts within the Deputy News Feed can only be deleted by staff members who have the appropriate permissions and are higher up on the work hierarchy. How Do I Delete a News Feed Post? To delete a news feed post, simply mouse-over the post you would like to delete and click the red 'Trash' icon. Please note that you can only delete posts from users who are under you in the Access Level hierarchy, therefore, you may not see this icon appear on posts other than your own. How do I read my staff employees direct messages? You can view/read your direct messages via the News Feed if an employee has sent you a direct message. You will receive a notification, and once you navigate to the news feed in Deputy you will be able to view the message and respond. How do I disable the newsfeed? Currently, there is no way to disable the News Feed. I don't seem to be receiving notifications for News Feed posts? 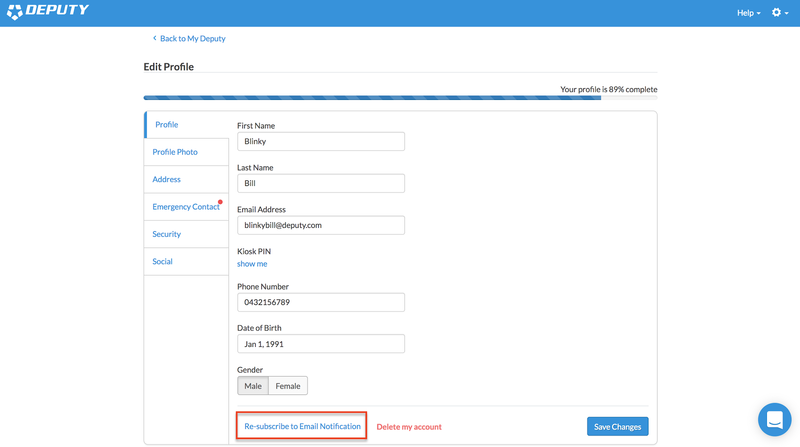 If you are not receiving any notifications on the Deputy web platform, you can go into your Deputy profile and re-subscribe to email notifications. On mobile platforms within your settings, locate the Deputy app and from here ensure that the app is given the appropriate permissions to display notifications. If you are still not receiving any notifications on your Deputy app please ensure you are on the latest version and uninstall and reinstall the app. If the issue still persists please contact one of our friendly support staff who will be able to assist you further. Why doesn’t the news feed show in chronological order & how can we customize the order? Currently, there is no option to filter how news feed posts are viewed in Deputy. Can admins read all direct messages? Direct messages can only be read by the people who the messages have been sent to. System admins can not view direct messages which have been sent between employees. Currently, within Deputy, there is no method to send reminders to staff who have not viewed important posts. Why is X employee not receiving Y news post? One of the reasons that an employee is not receiving a news post is because either they have not been included in the list of recipients or they are not in the area to which the news feed message as posted. Can we set groups for employees? Currently, this feature is not available in the News Feed. Can we edit the character limit? Unfortunately, this feature is not available in the News Feed, however, our development team is hard at work to bring a massive update to the newsfeed in Deputy so stay tuned!